Organizers are expected to file Monday for approval of initiative to expand health care coverage to thousands of low-income Utahns, as allowed under Obamacare. 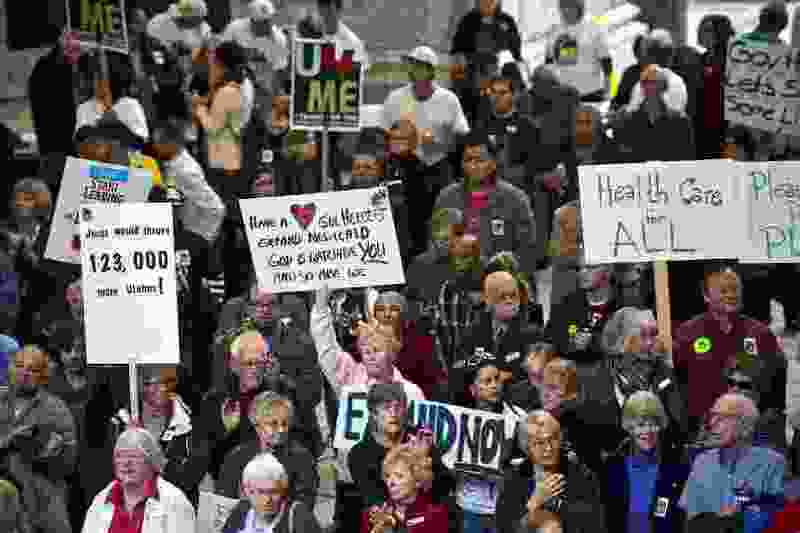 (Chris Detrick | Tribune file photo) Supporters of expanding Medicaid in Utah for low-income residents rallying on Capitol Hill in 2013. On Friday, supporters of the expansion announced they will seek to place the issue on the state’s November 2018 ballot. After years of failed attempts for large-scale Medicaid expansion through the Utah Legislature, health care advocates are turning to voters to give about 120,000 Utahns health care coverage. Utah Decides Healthcare – a group that includes the Utah Senate’s only physician, Sen. Brian Shiozawa, R-Cottonwood Heights – is expected to file a proposed ballot initiative for Medicaid expansion in Utah to the lieutenant governor’s office at 1:30 p.m. Monday. If Lt. Gov. Spencer Cox approves the initiative’s wording, the campaign must hold seven public hearings across the state and collect more than 113,000 signatures from registered voters to earn a spot on the November 2018 ballot. The measure would fully expand Medicaid to low-income individuals and families that currently earn too much to qualify yet not enough to afford other coverage under the Affordable Care Act, also known as Obamacare. The expansion, which Obamacare makes possible for states, would primarily affect adults without children or other dependents as well as parents who don’t currently qualify for Medicaid, or about 70,000 to 80,000 people in total. It would also extend Medicaid coverage to about 47,000 low-income Utahns earning between 100 and 138 percent of the federal poverty level, or $20,000 to $26,900 yearly for a family of three. These residents could qualify for subsidies on Utah’s insurance marketplace, but many are unaware they are eligible or find it too expensive, said Stevenson. In 2016 the uninsured rate for these Utahns was 16.8 percent, or almost double the state average of 8.8 percent. The state’s share of the costs of they expansion would be $80 million, to be covered by an increase in the statewide sales tax from 4.7 percent to about 4.8 percent, according to Utah Decides Healthcare. Additional costs from the expansion would bring in about $700 million in federal money. If successful, the ballot measure would keep eligibility standards for Medicaid and the state-run Children’s Health Insurance Program as they are currently, with no caps on enrollment for either program. The Medicaid expansion initiative bring the number of causes seeking a spot on the 2018 to five, including measures to boost sales and incomes taxes to better fund public schools; legalize medical use of marijuana; create an independent commission for redistricting; and require direct primary elections for party nominees. A sixth measure — changing the time of military service required to qualify for certain property-tax exemptions — has already earned a ballot spot. Even if the Medicaid measure wins a majority of votes in 2018, its fate could be short lived if Congress passes a repeal of Obamacare — though several attempts at repeal have failed thus far in the Republican-controlled Congress. Plans to put full Medicaid expansion on the Utah ballot began about five to six months ago, with backing from a range of state-based organizations advocating for the disadvantaged and national nonprofit groups, said Maura Carabello, president of The Exoro Group, a Salt Lake City public-relations firm. The effort, Carabello said, reflects frustration over years of unsuccessful attempts on Utah’s Capitol Hill to expand Medicaid. Shiozawa, an emergency physician at St. Mark’s Hospital in Millcreek, said he has long supported expanding Medicaid. He is backing the initiative, he said, because Utahns’ taxes already pay for the program indirectly; thousands of needy residents would get coverage; and the expansion would create jobs. Advocates for low-income residents say a more robust Medicaid program would help keep many out of homelessness. State and county officials are now awaiting approval of a limited Medicaid expansion, proposed by state legislators, that would cover about 6,000 residents. That limited expansion also is woven into the long-term strategy behind Operation Rio Grande, a statewide effort to improve homelessness services in Salt Lake City and rid the downtown neighborhood of crime. The federal government has yet to approve Utah’s proposed Medicaid “micro-expansion,“ as it’s called. Despite backing from the Utah Senate and Gov. Gary Herbert, a wider Medicaid expansion has failed to pass the Utah House, partly out of concern among conservative legislators over its financial impact on state budgets. “I do not support full Medicaid expansion because I do not believe that it is fiscally sound,” said Sen. Daniel Thatcher, R-West Valley City. Carabello said key backers of the ballot initiative include Utah Health Policy Project ’American Association of Retired Persons; and several Utah physicians’ and nurses’ associations; as well as The Fairness Project, a national group pushing state ballot initiatives on economic issues such as the minimum wage; and Families USA, which lobbies for consumers on health care issues. Utah Decides Healthcare is moving to form a political-issues committee (PIC), Carabello said, but already has financial backers for the campaign ahead, though she declined to provide details. Passage of the measure would put Utah among 32 other states that have expanded their Medicaid programs, including adjacent states such as Nevada, Colorado and Arizona. In August, Utah Department of Health data showed nearly 295,000 Utahns received health care coverage through Medicaid and the Primary Care Network, a state program offers fewer benefits than Medicaid. If approved by Cox, the initiative will be sent to the state Office of Management and Budget for an official estimate on what it would cost. Once the estimate is complete, organizers are required by law to hold seven public hearings throughout Utah before collecting petition signatures. The number of required signatures represents 10 percent of Utah votes cast in the 2016 presidential election statewide, with signatures to be gathered in at least 26 of Utah’s 29 Senate districts. Signatures for each Senate district must be submitted to the county clerk’s office by April 15, which will verify they came from registered voters. With that deadline looming, Carabello said the campaign plans to move at full speed once ballot language is approved.